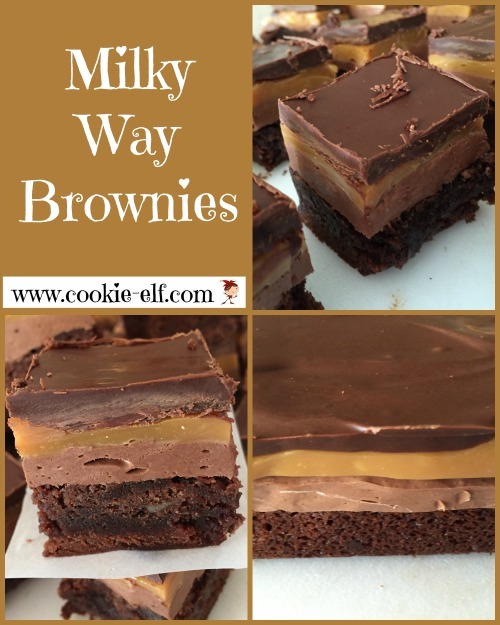 Milky Way Brownies are a simple layer bar cookie recipe that mimic Milky Way candy bars. They’re like eating a candy bar in bar cookie form. Can you say a-m-a-z-i-ng? Milky Way candy bars debuted in 1923, the brainchild of Mars, Incorporated food company founder Franklin C. Mars. Contrary to urban legend, the candy bar was not named for the galaxy but rather the Milky Way milkshake, a popular malted chocolate dessert. By 1930, Milky Way was the #1 selling candy bar in the world. Today, the bars account for $100 million in sales. In the American version, the candy bar is made up of layers of chocolate nougat (a creamy, sweet filling) and caramel with a firm milk chocolate coating. European versions omit the caramel layer. The brownie recipe uses that same layered format. This version is especially simple when you use a brownie mix. Preheat oven to 350º F. Line an 8 x 8 baking pan with parchment paper or aluminum foil, allowing ends to extend over two sides of the pan. Coat the liner lightly with vegetable spray. Brownie Layer: In a medium bowl use an electric mixer or a wooden spoon to combine brownie mix, oil, eggs, and water according to package directions. Bake brownies 45-50 minutes until a toothpick inserted in the center comes out clean. Do not over bake. Remove brownies from the oven and allow them to cool. Set brownies in the freezer for 30 minutes to set. Nougat Layer: Pour 1 cup chocolate chips into a microwave safe bowl and set in the microwave, cooking for 30 seconds at 50% power. Stir and repeat until chips are melted. Remove bowl from the oven. Add marshmallow crème and 2 tablespoons milk. Combine with an electric mixer on low speed until ingredients are well blended. Spread nougat evenly over brownie layer. Return the pan to the freezer until set, about 30 minutes. Caramel Layer: Pour unwrapped caramels and 2 tablespoons milk into a microwave safe bowl and set in the microwave, cooking for 30 seconds at 50% power. Stir and repeat until caramels are melted. Remove bowl from oven. Spread caramel mixture evenly over nougat layer. Return the baking pan to the freezer until set, about 30 minutes. Chocolate Coating: Melt chocolate chips and butter in separate bowls. (Here’s how to melt chocolate chips.) Combine melted ingredients together. Spread the chocolate coating on top of the caramel layer. Return the baking pan to the refrigerator or freezer until it sets, about 30 minutes. You can substitute whole milk, reduced fat milk, or even sweetened condensed milk for the evaporated milk. Water causes chocolate to seize when melting. Be sure to melt chocolate chips and butter separately to prevent chocolate chips from seizing – otherwise, the water in the butter or margarine will create problems. See more easy brownie variations on our Brownies Pinterest board.